Once you can play tunes on the 4 hole Speedy harmonica confidently, it’s time to step up to 10 holes. There are lots of different brands of 10 hole harmonica. Some are nicely affordable; others can be quite expensive. But there’s always one to fit your price range. Many have a black acrylic comb (the middle part of the tin sandwich), like the one shown here. Others are made from wood like the one below. The notes are normally arranged the same way in both. Ask a grown up to help find one you like – in the key of C major. 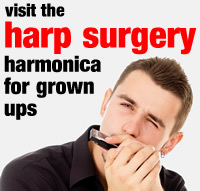 Your harmonica teacher will know where to buy one at a reasonable price, otherwise grown ups can contact us here at the Toot Suite and we will help. If you’ve been using a 4 hole harmonica, you’ll find the middle holes of your 10 hole harmonica (holes 4 to 7) share exactly the same pattern. 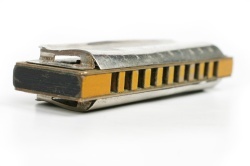 Hole numbers are usually printed along the top of your new harmonica. The holes will feel smaller and closer than a 4 hole harmonica, so your lips will take a while getting used to the new layout. But you’ll soon get the hang of it. Some children cover the holes either side of the middle four with decorators’ tape (holes 1 to 3, and 8 to 10) until they are used to the new arrangement. Using holes 4 to 7, try playing some of the tunes you already know. This will help train your lips. Then work through the 10 Hole Harmonica section in our Categories menu. Meantime here’s a tune to get your started. Each number tells you which hole to play. D means draw (breath in). B means blow (breath out). So let’s play. Click the green button under each chunk to hear how it goes.